Sony has finally revealed “official” details of the process for upgrading the PS3 version of a game to the PS4 version, and it only applies to four select games, so read on to make sure you’re set for launch on November 15. The four games in question and that you’ll be able to upgrade for the Playstation 4 are Assassin’s Creed IV: Black Flag, Call of Duty: Ghosts, Watch Dogs and Battlefield 4. Essentially, when you purchase these games (either disc or digital version) you’ll receive an entitlement to download a digital copy of the game for Playstation when it becomes available, for the price of $9.99. If you buy the disc version, you’ll get an upgrade code included in the box. Redeem the code in the Playstation Store and you’ll be able to download the PS4 version. You will, however, need to hang on to that PS3 disc because it will need to be inserted whenever you go to play the digital PS4 edition. If you buy the digital version of the PS3 game then things will be a lot easier. You simply need to login to the Playstation Store and search for the PS4 version of the game. It should show up for $9.99. You then just download it and start playing! Oh, and the upgrade program has a limited run time in respect of each game. 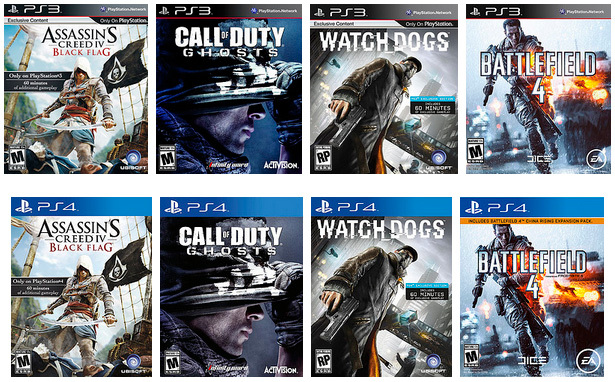 For Assassin’s Creed IV and Watch Dogs you’ll need to upgrade by January 31 2014, for Battlefield 4 by March 28 and for Call of Duty: Ghosts by March 31.